Of course tying tools will be tying tools and reels will be reels. Now and then, however, there are new products, breathtaking inventions or just small, but helpful new gadgets. So, from time to time, I'd like to present different items than my colleagues, items representing new ideas in fly fishing and fly tying. Because of that I have developed quite a few tools and vises myself, and that's also why I'm producing them myself, too. Still I agree that many products already on the market are outstanding, and so I'll include some in my sales program, step by step. This product owes its existence to inquiries of fly tiers already using my normal (thicker) ribbing wire wishing to buy a product with a finer diameter. Like our normal ribbing wire, this new wire is formed by two intertwining strands of wire. The diameter of the wire being used is now .10 mm instead of .15 mm. The product is considerably finer and well suitable for smaller nymph patterns. 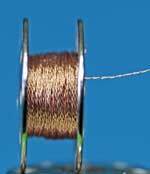 Otherwise, the effect of this wire is identical to that of the standard wire, also identical are length per spool and delivery on sewing machine spools. 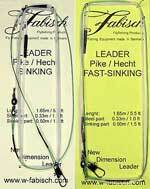 The Fabisch Pike Leader consists of three sections. The first section which is looped onto the fly line consists of a 1-m-long polyamide braid holding a lead core of .5 m length. The length of the lead core is identical in both versions, but is much thicker in the quick-sinking version. The braid is connected to .35 m of monofilament polyamide, which serve to a certain degree as a shock absorber when playing heavy fish. The monofilament part has loops on both ends, thus allowing for a quick change of the third section, consisting of steel leader material, or for adding further smaller mini sink sections, allowing you to fish even deeper. The monofilament section is followed by the .3 m steel section which has a swivel that connects it to the monofilament, and a "karabiner" (spring hook) to hold your streamer on the front end. For 45 Years now I have been active in fly fishing, and I have tried hosts of materials and devices. Also just about everything used with wading. As far as wading underwear is concerned, I tested two-piece suits as well as one-piece overalls. Among them were items costing well above can$300,00, and they didn´t last any longer than the less expensive ones. A friend of mine and myself have tested the Jenzi-overall for over a year now, and the results have been positive except for one detail. This one detail, however, has been rather annoying at times. Every few minutes one or both of the suspenders would slip off our shoulders. On our 2015 Canada-trip we used cable straps as a temporary remedy, but you can´t sell a product like that. Changing the way the suspenders are sewn on would be an option, but it would raise the price above can$150,00. Meanwhile I have found a perfect solution: an elastic strap with metal clips on either end. Use it to connect the suspenders in your back, and they won´t slip any more. I am adding one of these straps to every Jenzi-overall sold. The overall consists of a multi-layer microstretch fleece weighing 250 g/m². The zipper can be opened from the top down or from the bottom up. Fleece-Overall, available in sizes M,L, XL, XXL, and XXXL. Please add wanted size to item-number! Small material clamp for those of you who like to work with CDC-feathers and dubbing. 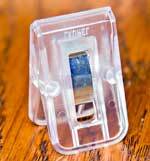 The clamp being crystal-clear allows you to see how far the material you work with extends into the clamp. Here's a way to tidy up your workbench. The spool tower offers seven compartments each on four levels: room enough for 28 spools. 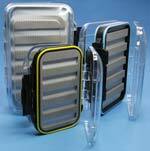 You may also use some compartments for bead heads, hooks, dubbing or what have you. Little boxes for such small parts fitting exactly into the spool tower's compartments are available, but not included. 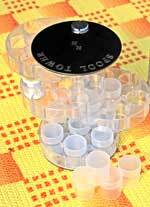 Included, however, is the transparent plastic container that holds the entire spool tower. So, if you plan to take your tying materials on a fishing trip or to a tying workshop: load it into the container and get going. During transport, nothing will fall out. If you need any further information, please feel free to use my contact page to write me your question.